I’ll admit it, I’m a bit crazy. Over the Memorial Day Weekend, I went to the local farmers market. When I walk down the aisles of a farmers market, I draw comparisons to Virtual Tradeshows. Crazy, right? Well, here’s how I make the analogy. At a farmers market, I’m in the “market” for fruits, vegetables, drink, snacks, etc. At a Virtual Tradeshow (VTS), I’m in the market for the products and services provided and sold by the exhibitors. The assorted VTS booths are similar to the many stands at a farmers market. And here’s a key point of farmers markets – the stands tend to sell the same varieties of fruits and vegetables. In a VTS, the exhibitors sell the same types of products and services. 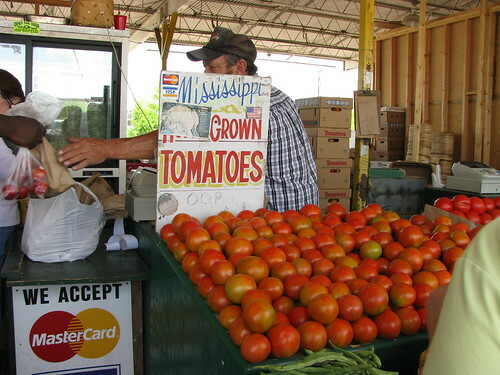 At the farmers market, I saw tomatoes, asparagus and corn at many stands. At a VTS on “backup”, I’m bound to see many booths that highlight a vendor’s backup solution. The challenge to the farmer is the same as the VTS exhibitor – how to stand out from the crowd? At a VTS, content is obviously very important – your booth description, logos, Flash movies, White Papers on your products, Case Studies, Podcasts, on-demand webinars, etc. Content will go a long way in differentiating your booth from your competitors’ booths. But content can only go so far. VTS attendees may have a hard time choosing between two baskets of strawberries that look quite the same. This is where knowledgeable booth reps make a difference. At the farmers market, a young farmer (selling strawberries) went into great detail on the difference in flavor between the Chandler and Camarosa variety of strawberries. He was quite an engaging speaker and invited us all to sample each variety and make our own judgments on which was sweeter. And I’ll tell you, if I came across two stands selling Chandler and Camarosa strawberries, I’m buying from the one with the more knowledgeable seller. I next ventured to a stand selling cherimoyas, an oval-shaped fruit that’s indigenous to the Andes mountains in Ecuador and Peru. 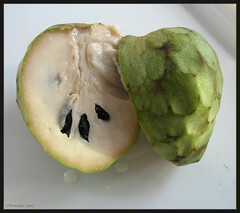 I had never heard of this fruit, so it was helpful to hear a farmer provide a quick overview – nutritional value, taste, flavor, how to peel, etc. This knowledgeable “booth rep” increased the likelihood that I’d buy or try some – if I had strolled past this stand and did not receive any information, I’d sneak a glance at them and continue walking. The same holds true for a virtual tradeshow. Spend the time making your booth look great and provide excellent content. But, make sure you bring knowledgeable representatives to the event (e.g. Sales, Sales Engineers, Product Marketers, Product Managers, even Directors and VPs). They’ll make a big difference in differentiating your crop of products and services from the booth next door. This entry was posted on Sunday, May 24th, 2009 at 7:56 AM and is filed under Virtual Tradeshows (VTS). You can follow any responses to this entry through the RSS 2.0 feed. You can leave a response, or trackback from your own site. Content comes in many ways. The most powerful content always comes directly from people and the better the persons knowledge the better the content. Hence one of the most powerful features of a Virtual Event. The ability to put the most knowledgeable people from a company in front of the buyer, no matter where in the world the buyer and the resource are. Great analogy, I enjoyed reading this.